Dr. Arun Prasad, MBBS, MD(Paediatrics), is a Sr. Consultant Paediatrics at Alchemist Hospital, Panchkula. Prior to that, he had career stints as a consultant Paediatric Gastroenterologist at MIDAS Institute of Gastroenterology, Nagpur. Apart from this, he has worked in various hospitals in Tricity which includes INSCOL, IVY Hospital, Grescian Hospital as a Consultant Paediatrician. Dr. Prasad did his basic medical studies from PGIMS, Rohtak followed by postgraduation in Paediatrics from prestigious PGIMER, Chandigarh. Besides, he has accomplished specialized training in Paediatric Gastroenterology. After his post graduation, he did 3 years residency in the Department of Gastroenterology at PGI, Chandigarh. Thereafter, he worked as associate professor at Nagpur Medical College for a tenure of 3 years. 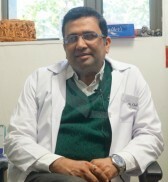 Dr. Prasad has contributed his research work in various National and international journals. He is an active member of various professional associations and actively participates in workshops & conferences to hone his knowledge and skills.